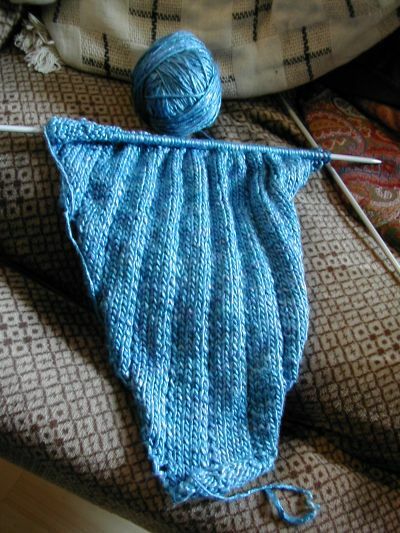 I started making another clapotis yesterday with the blue silk I got from the yarn coop. It is gorgeous to knit with and so smooth and shiny. I’m using a spreadsheet from the Clapotisknitalong2005 Yahoo group to keep track of the rows and am also purling the stitches to be dropped rather than knitting them. It’s a lot easier to see if you’ve gone wrong that way. So this one should be a lot more accurate than the last! I’m definitely addicted to this pattern! You can see a ridge now where the stitches will be dropped eventually. 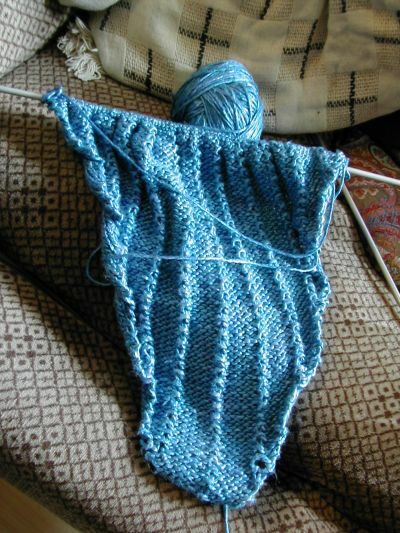 Love the color yarn you’ve chosen!